Nouakchott/Dublin - Since late January, some 57,000 Malians have entered the Mbera refugee camp in Mauritania. Numbers of refugees are increasing, from 200 arrivals daily two weeks ago (5 April) to 1,500 two days ago. In response, Médecins Sans Frontières/Doctors Without Borders (MSF) is stepping up its work in this area, where access to medical care is extremely limited. In the Mbera camp, in the heart of the Sahel region and a six-hour drive from the nearest reference hospital in Nema, MSF is providing primary and maternal healthcare to refugees and caring for malnourished children. MSF is also helping local populations by maintaining health posts in the region. “A great number of people are suffering from respiratory infections and diarrhea due to a lack of access to water, exposure to extreme temperatures and frequent sand storms,” stated Jean-Paul Jemmy, MSF medical coordinator. As the number of refugees increases, so does the pressure for humanitarian response to improve living conditions within the camp. There are currently 100 communal latrines for 57,000 refugees and just nine litres of water per person, per day. These conditions are below humanitarian standards, which call for 20 litres of water per person, per day, and one latrine per 20 people. “We are still expecting several thousand refugees in the coming weeks. With this constant influx of refugees, we have to act quickly and efficiently to provide emergency services; we must provide sufficient shelter, water and sanitary facilities and reinforce overall emergency medical assistance,” said Jean-Paul Jemmy. 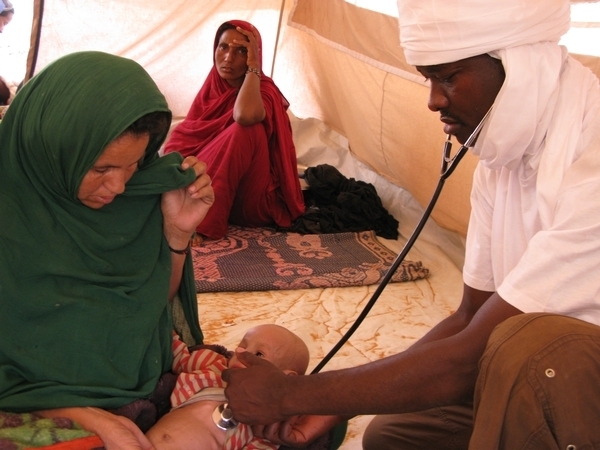 Since February, MSF has held over 8,500 primary healthcare consultations in Fassala and Mbéra (Mauritania). MSF has also been responding to the medical needs of Malian refugees in Niger and Burkina Faso. The organization is also working in the north of Mali (Timbuktu, Gao, Kidal and Mopti), where it offers primary healthcare to people displaced by violence.